300 so blatantly deserves to be hated. It is so contrived, polished and purpose built for fanboys that is screams ‘unworthy’. But damn does my inner fanboy forgive it quick. Zack Snyder hasn’t handled his freedom and creative licence well since he burst out of the blocks with the (still fanboy friendly) ferocious remake of Dawn of the Dead. For mine 300 represents a drop in quality from DotD but nevertheless remains an especially watchable affair – in a very guilty way. 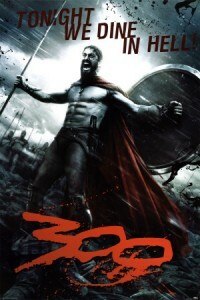 300 portrays an especially masculine period in history, focusing on a small band of Spartans who stood against the might of the invading Persian army. Countless thousands versus a few determined, brave men… perpetually shirtless, oily, buff, airbrushed, overly macho, prone to moving in slo-mo and talking in inane macho dialogue, brave men. It all starts because the Spartans are raised from youth to be Tonka tuff – they probably also eat too much meat and don’t hug their Mummies enough – so when an envoy from Xerxes, leader of the marauding Persian armies, drops by for a chat and a biscuit, King Leonidis (Gerard Butler) chooses to interpret his ‘kneel before us or be crushed under our millions of sandaled feet’ as some kind of veiled threat. Leonidis slo-mo kicks the envoy and his buddies into a conveniently located bottomless pit, but after being told by the freaky misshapen Spartan elders that war is out of the question, he slo-mo bangs his loyal wife (Lena Headey) and takes… oh about three hundred of his best buds for a walk. And a look. And best believe loads more slo-mo. Leonidis and his oily troops are gung-ho for a stoush, knowing full well that for a Spartan the best way to die is in battle, and surely taking on an army that outnumbers you so heavily almost assuredly provides a glory guarantee? I kept a straight face as wave after wave of Persians attacked in exquisite slo-mo, only to be thwarted, impaled and eviscerated in an aesthetically pleasing ballet of violence. I remained mostly smirk free until the rock music started to announce a mutant rhino attack. Thankfully this was the only sequence that stood out as a little too much, which is admittedly insane in a film which boasts giants, demons, mutated dwarves and Xerxes, a 7 foot tall slender, pierced, frankly beautiful man, with more gold and chains than a Real Housewife of Arabia and a voice deeper than Barry White. Final Rating – 7.5 / 10. HOO-WAA!